Like anything else, gardens have evolved over the years, especially city gardens. The most common request I receive from customers is to design their landscape so that it is manageable to maintain but still looks good and is environmentally sustainable. Here are some of the ways that I achieve my garden designs and incorporate the popular trends that most people request. 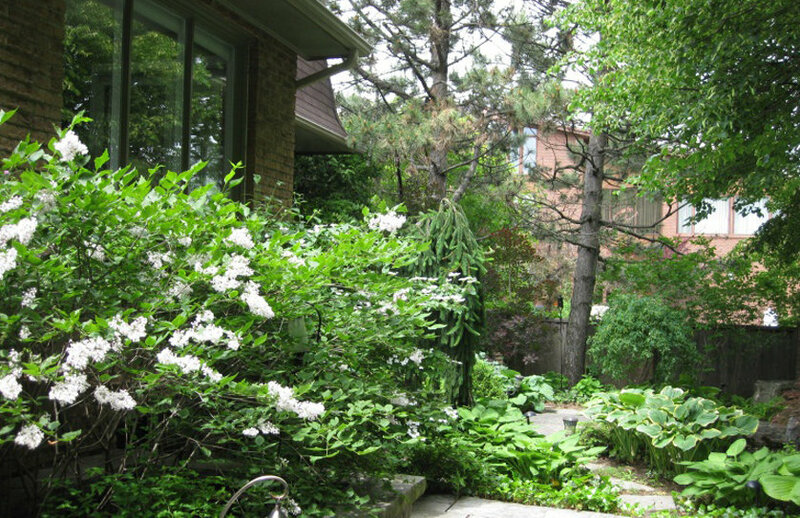 Design requirements for low maintenance gardens must consider both hardscape choices as well as thoughtful plant material selection. After all, plants must be able to tolerate the microclimate of the site and suit the overall style and taste of the homeowner. 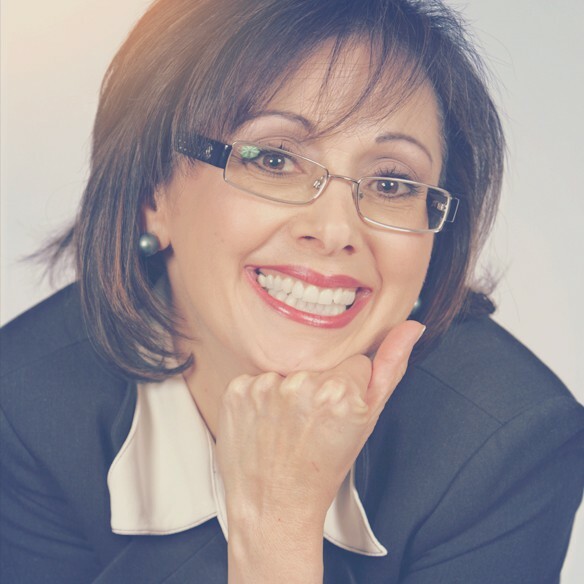 Replace turf lawns–Lawns are water hogs and require a ton of maintenance and chemicals to maintain so replacing them with other things makes a lot of sense. Consider replacing lawns with mass planted beds, meadows, succulents, pathways and/or living areas. Incorporate native plants–Native plants will adapt quickly to local climate conditions and usually thrive without a lot of help. But don’t get me wrong, it’s still important to carefully think-through the plant selection for your garden to make sure that you’ve selected appropriate choices that are meet site conditions and are both appealing and relative to the scale of your garden. Have fewer numbers of plant varieties–It’s much easier to manage a lot of the same plants than to maintain lots of different varieties of plants. Also, it’s easier to create visual impact in the garden with mass plantings. Subtlety in gardens–Gardens don’t have to be “over-the-top” these days; subtle colour ranges such as all white or one-colour gardens or interesting edging and textural plant materials can provide a calming effect that people want to feel when they are outside. The simplicity in design and form also makes for lower maintenance and upkeep. 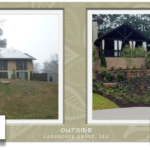 Sustainable features–Oftentimes landscapes come with topographical challenges that may lead to drainage or storm water problems. Therefore, landscape designs should give consideration and attention to such things before hardscape and planting beds are installed. It’s important to know how water traverses your site and to design the garden with water management solutions in mind. Thanks to the introduction of new outdoor fabrics that are being made from acrylic fibres and are fade-resistant and waterproof we can now create permanent outdoor living spaces that are both comfortable and practical. This helps us to bring the inside comforts of our homes to the outside as well. Covered structures and screened-in porches–It’s easier to enjoy the garden when you feel protection from the elements. Incorporating covered structures or screened-in porches extends the use of your outdoor space and is usually a wise spend when planning a garden. Outdoor entertainment areas–Outdoor fireplaces, outdoor living rooms with fire-pits, outdoor dining rooms and lounge furniture are universally requested items nowadays because they extend the use of the garden and provide wonderful areas for socializing and entertaining. 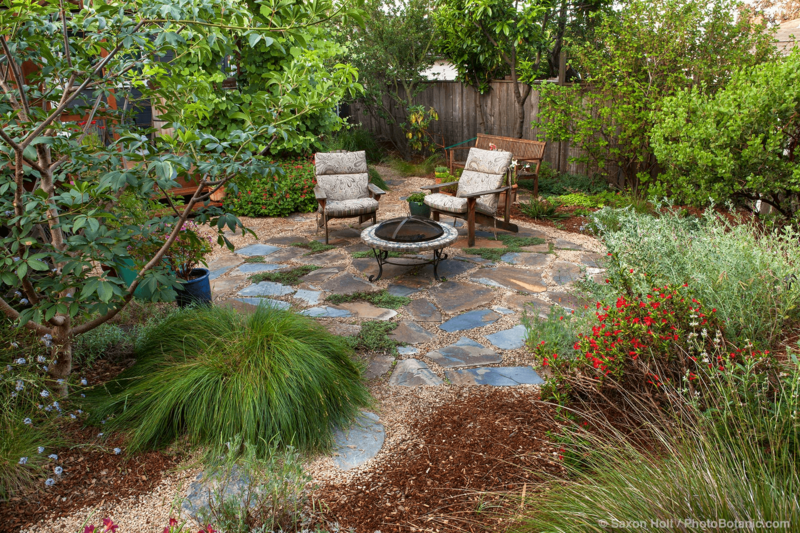 More people are creating blended gardens that incorporate both edibles and ornamental plants. 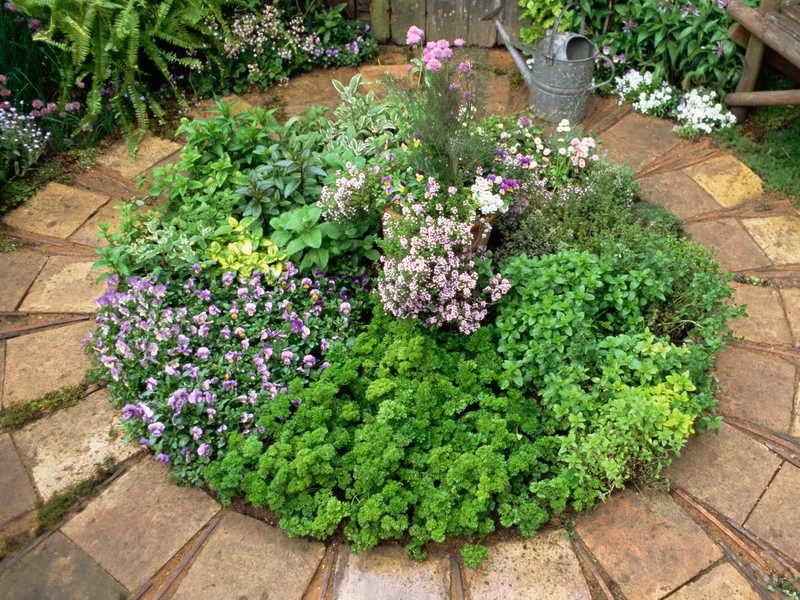 It’s a great idea because such gardens give a bountiful harvest of fruit, vegetables, and/or herbs and are a wonderful alternative to turf grass. Edibles are also a great choice in urban environments; they allow people to share or trade their bounty with neighbours. There are a variety of ways to incorporate edibles into your garden. Potted Herb Gardens–it’s easy to grow herbs and veggies in ornamental pots situated in a sunny location that are accessible to your kitchen. Tomatoes and lettuce are easy vegetable choices for pots. Vegetables Mixed with Ornamental Plants–as long as conditions are suitable for growing, it’s fun to include vegetables among ornamentals or dedicate a planting bed for growing your favourite veggies. Living Fences–it’s possible to replace hardscape fencing with living alternatives such as hedges or espalier (pronounced es-PAL-yay). Using standard pruning techniques, you can train dwarf fruit trees or shrubs to form a living wall that will enhance your garden’s privacy and provide both beauty and possibly fresh produce. In an “espalier” plants grow along a usually flat, symmetrical framework against a wall, terrace or freestanding support. Frequent pruning and tying of new growth directs the plants into a decorative pattern as intersecting diamonds or horizontal arms and elbows. Although creating an espalier is relatively easy to do, it does take time to achieve a bountiful harvest. Expect to wait 3 years for fruit and plan to spend some time each year doing light pruning and training of branches. 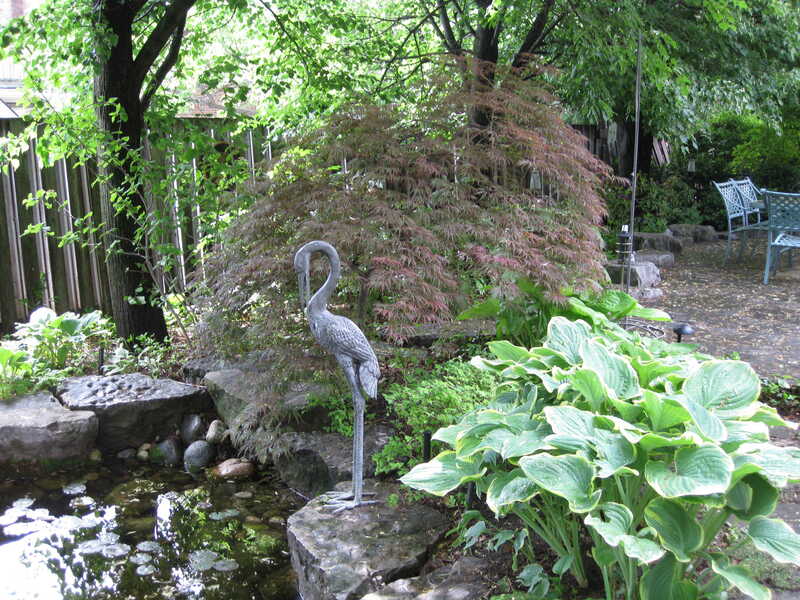 These are gardens that may include sculptural elements, whimsical features and/or artwork. Such gardens don’t need to be tacky; if done with care and attention to the rules of good design, they can elevate the garden’s overall impact and appeal. The idea is to add ‘just the right’ accessories to enhance the garden. Just as you would add artwork, accessories and wall décor to your inside spaces to create design appeal, you can also add interest to your garden with artful elements such as water features, sculptures and wall/fence décor. Water Features–The sound of water is soothing to the senses and can drown out surrounding noises of urban traffic. They are popular across all budgets and can create an attractive focal point in the garden. Water features range in price from inexpensive, self-contained systems in an urn or portable fountain to high-end water walls and ponds. Garden Art–A single sculptural piece situated in the right spot can add unbelievable impact and interest and make your garden a more enjoyable place to hang out. Since most of us may not have the budget for high-end bronze sculptures consider other options such as iron, cement or resin sculptures or even a simple gazebo or trellis painted in a bright colour. Wall-mounted sculptures are also great additions to fences or exterior walls, especially if they are situated purposefully, to create a beautiful vantage point from inside the house to the garden. Artful Furnishings–a beautiful garden bench, table or stool can add an architectural element to your garden that adds to its appeal. One example is the classic “Lutyens Bench,” designed by Edwin Lutyens, an English architect who lived in the late 1800’s. He installed his bench into many classic English country garden estates of the Victorian era that he designed with Gertrude Jekyll during the “Arts and Crafts Movement” in England. This bench continues to be popular today. 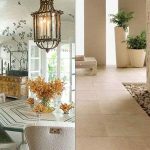 However, there are many other ways to incorporate artful furnishings to your garden to complete the look and feel of an area and transform an ordinary space into an extraordinary space. Today it’s possible to find reused, reclaimed, recycled and salvaged pieces. 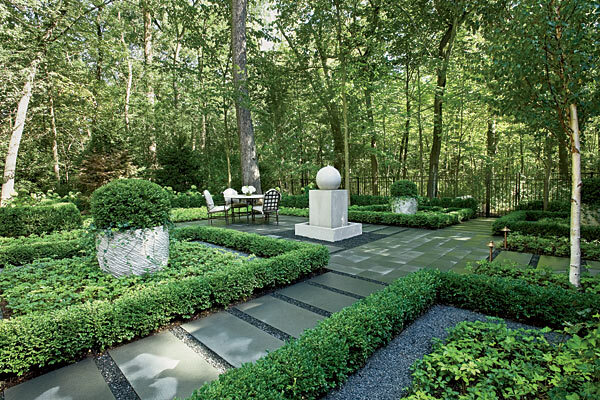 There are countless ways to create timeless gardens that are on trend. Think about what suits your lifestyle, taste and budget and works best to extend your indoor décor style to the outdoors.